Only two big Reliability Trials were held each year in December. The London-to-Gloucester-to-London and the London-to-Exeter-to-London, but the support which these events received was truly remarkable in the extreme and was certainly a proof that motorcyclists took more than a little pleasure in defying the elements in what was one of the hardest months of the year. Neither event could be really termed as exceptionally severe as far as the course was concerned, but as one was a 12-hour Trial starting at 7am and the other involved riding throughout the entire night the large entry list obviously showed that among competition riders there were a great number who cherished the spirit of adventure. Secretly, if not openly, many of those who with immense enthusiasm year after year competed in the London-to-Exeter hoped against hope for snow bound roads, for the more difficult the task the greater the battle to be waged against the elements, the better were they pleased. At Christmas time the fireside and home comforts were surely a counter-attraction, from which none but the most hardy of men, and women, could tear themselves away. Nevertheless, each year the total number of entries in these two great Classic events showed an increase. Much of the credit was due to the organising Clubs, for the two Clubs concerned, the Motor Cycling Club and the North West London Club, ran their events in a way which compelled admiration and warranted the fullest support. Amongst a group picture of 101 riders under the heading of "MAKERS OF HISTORY, 1927", in the December 8 issue of the Motor Cycle, was one of Gus Kuhn, winner on a Velocette of many solo races at the Crystal Palace. 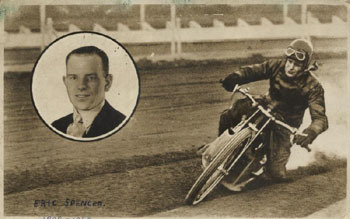 Included also were Speedway notabilities-to-be, Oliver Langton (Scott), winner of the Scott Trial, Alec Jackson (Sunbeam), winner of the Lancashire Grand National, Len Pellat (OK-Supreme), highly successful at Brooklands and the Crystal Palace, Syd Jackson (AJS) and, of course, Miss Fay Taylour (AJS), winner of the Unlimited cc Cup at the Camberley Club's "Dirt Track" meeting. But back to that London-to-Exeter-to-London Trial. Each year, three to four hundred hardy souls tore themselves away from their comfortable firesides, donned the most impossible garments, and set forth into the darkness and, generally a wet night. And, as I have remarked, GUS KUHN was one out of that impressive number. "Why? ", you might ask. Well, the Christmas Trial was first organised as a restorative to remove that sinking feeling caused by too vigorous eating. But there was something else. The "Exeter" was certainly an adventure and generally a fight against the elements. Every competitor was an out-and-out enthusiast - he had to be. Ever since the first-ever "Exeter" in 1915, competitors have begged and entreated Jupiter to give them a real Trial, with ice, snow and hardship. And now at last this 13th event, the weather god had taken notice. On Christmas Day it started to snow and before the evening was out the flakes were falling merrily, and the roads, trees and houses were covered in an attractive white mantle. The next morning it was a full eight inches deep and a howling East wind. In some places the snow was well over a foot deep; and there were severe drifts too. In spite of the difficulties quite a few competitors arrived at Slough for the start and at least a hundred competitors, muffled to up their eyebrows with little more than their pink noses visible, were ready and waiting and tough-man Gus Kuhn was one. The organisers seated by a telephone in the Peerless Restaurant were listening to reports from various points on route. Message after message came in - all alike - roads impassable! Officials held a hurried meeting, and a few minutes later they announced the Trial cancelled. The news spread like wildfire and competitors dashed into the restaurant. Was it true? Was the notice official? Some were annoyed; all were bitterly disappointed. At last a REAL "Exeter" and the Trial was off. Several, even when they learnt that the snow drifts were in places on route as much as fifteen feet deep, decided that they wanted to set off, and they even signed and pinned on the notice board a piece of paper headed, "We desire to start." Such was the fantastic enthusiasm 50 years ago. [written in 1977] Later, however, they realised the impossibility of winning through, even with the use of the picks and shovels which many competitors had brought in readiness. In the inner part of the restaurant a band was playing - a most excellent idea - and a few competitors started dancing just as they were, dressed like Arctic explorers! The majority, however, fell to relating how they fought their way to Slough. But Gus Kuhn didn't want to emphasise his difficulties, although it took him great will-power to reach the start. It was nothing new to him for eight years previous on his amazing trip on a belt-driven Levis 2-stroke from Birmingham to John O'Groats, John O'Groats to Birmingham, Birmingham to Land's End and Land's End to Olympia, he had encountered on his single-speed machine, much worse conditions, especially around the Shap area and the Cheviot Hills. Gus was enjoying a smoke in the restaurant - he liked his cigarette - and with his friends talked over old times. a great exponent of the sport but also Gus's friend. Here he is later in 1929, speedway racing. And so the thirteenth "Exeter" took place on January the 13th, with the first competitor off at precisely 8pm at Slough. Another "Gus" had entered, too. This was Gus Grose, the well-known London motorcycle agent, on a 490 Excelsior combination. Harold Taylor - the one-legged driver - who would later feature in many sidecar Dirt-Track meetings, would be driving a 1,076cc Morgan 3-wheeler and Jack Parker (BSA), Eric Spencer and Del Forster were there too. The route for this 24-hour event from Slough went through Reading, Newbury, Andover, Salisbury, Shaftesbury, Yeovil, Honiton, Sidmouth and on to Exeter. The return route from Exeter included Gittisham Hill - a new innovation - and Salcombe Hill. Then on to Axminster, Beaminster, White Sheet Hill, Dorchester, Blandford, Salisbury, Andover, Newbury and Reading to the finish at Slough. Throughout the night run from Slough to Exeter the weather was perfect, but on the return run the greater part of the distance was covered in rain. Nevertheless the Trial was a great success. Gus Kuhn's bad luck had changed and he won a Gold Medal as also did Jack Parker, Eric Spencer, Del Forster, George Wallis and Harold Taylor. It was January, 1928, British National Dirt-Track Racing would be with us in a few months time, and Gus Kuhn would play a great part in the sport's institution. Plans had already been made by the Ilford Club, headed by Jack Hill-Bailey to use the athletic running track at the back of the King's Oak Hotel in the heart of Epping Forest near Loughton in Essex for DT racing, the first meeting being scheduled for February 19. The Manchester Club was not lacking in initiative for members arranged a DT meeting on March 3, at the Audenshaw Trotting track, and many other Clubs were planning programmes. But previously, long before the illustrious Australian broadsiders arrived in England in April, Billy Galloway and Keith McKay had landed by boat around Christmas, 1927. They were the first-ever Australian riders in Britain and the late Jimmy Baxter arranged with "Pathe News" - the movie film people - for these two riders who had wide experience of the sport, to give an exhibition of broadsiding on the cinders running track at Stamford Bridge. Billy called on me last year  and I asked him about this notable event. "Two Douglas machines were loaned to Keith and myself by the manager of the Douglas depot in London," he said, "but actually it was rather a frightening experience as the track was very hard, and we were used to a loose and heavy surface. On the outside of the circuit was a curved, spiked fence to keep the spectators back; it was anything but a Dirt-Track. The cameramen had erected a raised platform on one of the beds and the circuit being as it was we didn't have a lot of control in the slide. I didn't however fall off or knock over their platform but I well remember going very close to it once or twice!" Actually it is a little-known fact, but this was the first-ever quarter-mile Dirt-Track demonstration in Britain. Billy Galloway (on holiday in England last year), is now over 70 years old but he is still sprightly and gay. [written in 1977] Sadly his pal Keith McKay was killed while racing at Sydney in the Australian Speedway season of 1929-30. These two, of course, took part in the Ilford Club's first-ever Dirt-Track meeting at King's Oak in the ensuing February, both on Douglases, the circuit being quite unique as it was in the heart of Epping Forest. Surprisingly, it was a whole-day meeting only interrupted by a break for lunch which could be had at the adjoining King's Oak Hotel for 4/- or 20p in today's money. Teas were 1/6d, or 7½p! And admission charges, sixpence or 2½p. How times have changed! An estimated thirty-thousand spectators turned up and the 500 programmes were entirely sold out within an hour. Billy Galloway tells me that he rode Freddie Dixon's TT Douglas and never got out of bottom gear! Gus Kuhn's name did not appear in the programme for this initial meeting, but it was a foregone conclusion in London that a fellow like him with such an appetite for competitive motorcycling would not stay away for long from this amazing new sport and would be competing at the earliest opportune time. And so it was that Gus on his Birmingham-made Calthorpe roadster (one of which could be purchased brand new for £44) that had provided him with so many hours of enjoyment and had won for him a considerable number of awards, appeared in the second meeting at King's Oak the following Easter Monday. Meanwhile, Gus took part on his three-speed, 348cc Popular Calthorpe (the Super Sports Model being priced at £60 brand new) in the National Southern Trial, held in the South Eastern Centre's area when, in perfect weather, 120 starters had a thoroughly enjoyable day's fun. And the competitors included such Dirt-Track notabilities-to-be as Eric Spencer (Douglas), Triss Sharp (Zenith), Arthur Warwick (P&M), A H Willimott (HRD), Gordon Norchi (Coventry-Eagle) and Harold Taylor (McEvoy). And Gus won a Gold Medal as also did Eric Spencer, the trial being won by Vic King on a Douglas. Sadly, just as Cyril May's story reaches the beginning of Speedway in Britain, 'Speedway Express' ceased publication and the monthly instalments of this series ended.